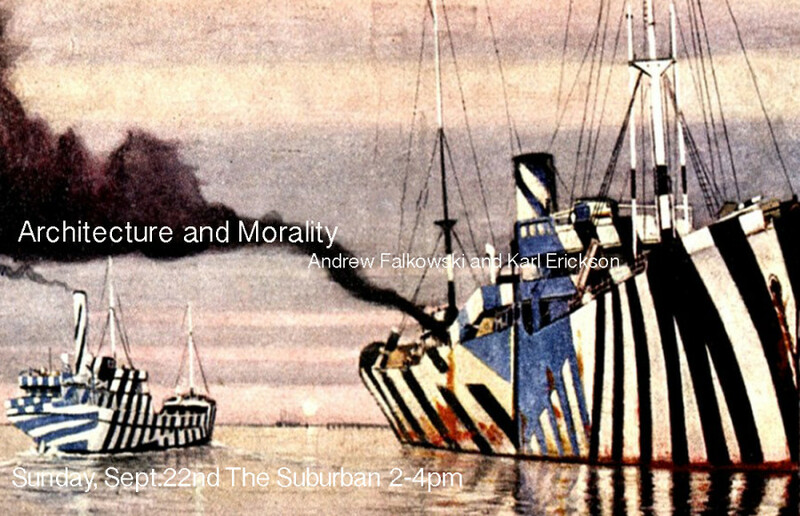 Andrew Falkowski and Karl Erickson present their fifth collaborative project, “Architecture and Morality” at The Suburban in Oak Park, IL. Unceasingly investing in diverse cross-cultural sources, “Architecture and Morality” features an installation of decollaged pattern paintings on paper, as well as two paper helmets and ‘armor’ more indebted to Hugo Ball than a medieval battlefield. Investigating dazzle camouflage, 80’s skateboard graphics, Marsden Hartley, Orchestral Maneuvers in the Dark, Erwin Rommel and Agnes Martin, Falkowski and Erickson examine the logic and image of various visionary strategies. Text, culled from a conglomeration of various writers, is cut out of, and layered onto, the nearly forty paintings, producing an oblique instructional manual on vision, space and violence. In the adjoining gallery Falkowski and Erickson present their earliest collaboration. Drawn in 1997 to occupy time while working at the MCA Chicago’s ticket counter, “Cube and Diamond” consists of a series of ridiculous cartoons loosely based around two geometric shapes. Rife with absurd takes on popular culture and critical theory, these cartoons laid the groundwork for the bleak yet ambitious gallow’s humor that has typified Falkowski and Erickson’s collaborative work. Karl Erickson’s primary media are video, posters, collage and latch-hook rugs and pillows. Recently he has been an artist in residence at The Arctic Circle and Lower Manhattan Cultural Council’s Swing Space Residency on Governor’s Island. Upcoming shows include at Hyde Park Art Center in “A Study in Midwestern Appropriation.” His videos will be shown as part of screenings at Creon Gallery in New York and Parsons Hall Project Space in Holyoke, MA. He received his MFA from California Institute of the Arts and his BFA from Wayne State University, Detroit, MI. Andrew Falkowski is a painter currently living in Chicago, IL. He recently had his fourth solo show at Rosamund Felsen Gallery in Los Angeles, CA. Upcoming shows include “A Study in Midwestern Appropriation,” at the Hyde Park Art Center, in Chicago, IL, and a two person show with Scott Reeder at Circuit 12 gallery in Dallas, TX. For more information, please contact Michelle Grabner or Brad Killam at bkmgcar@comcast.net or 708-305-2657.